Tipperary manager Shane Ronayne celebrates. 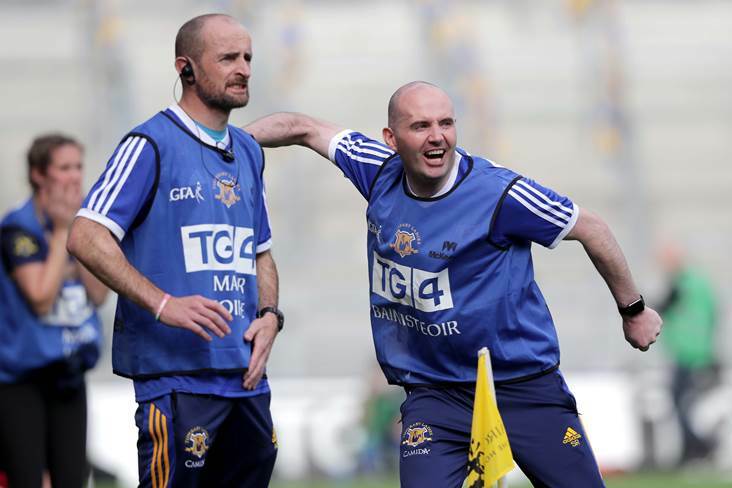 Tipperary ladies football manager Shane Ronayne will be on taxi duty tonight (SAT), on the eve of his side's crunch relegation final against Cavan in the TG4 All-Ireland senior championship. In order to accommodate Tipp dual star Orla O'Dwyer, the relegation clash was scheduled for Sunday in Virginia, but Ronayne has taken it upon himself to ensure one of his key players gets to Cavan in one piece. The rest of the Tipperary squad will make the trip north on Saturday afternoon, and Ronayne is just happy to have the Boherlahan player there to boost their chances of avoiding an immediate return to the intermediate grade. "It's not ideal going to Cavan. But it was the only option on the table, it was either play without Orla on Saturday or play with her in Cavan on Sunday," said Ronayne. "She is delighted to be able to play the game. The team travel up on Saturday, but I'm going to wait for Orla and bring her up after the game and she is looking forward to it." Defeat to Waterford in last weekend's play-off means Tipp now have to go again to maintain their top-flight status, which was only earned 12 months ago with victory over Tyrone in the TG4 intermediate decider. Relegation would be a huge blow to the Lidl NFL Division 2 champions, Ronayne agrees. "We were very disappointed on Saturday evening; we just didn't perform. Maybe we were over confident after playing well against Donegal. "We did a lot of soul searching but we met on Tuesday and the girls were in great form and we trained really well. We know this is last chance saloon. "It would be a severe blow to be an intermediate team playing Division 1 next year and I don't know how that would go down. Anything could happen if things don't go our way: players or management could step away. "It's a strange position to be in after the good start we made to the year. The prize for winning on Sunday is huge: it'd be like winning an All-Ireland final all over again." On the other side of the fence Cavan have also had a tough summer and have not won a game at all since their league semi-final victory over Waterford in April. After that win, they went on to face Tipp in the league final where one point separated the teams. Cavan manager James Daly knows his side face a tough test in their fight to avoid the drop. "It has been a tough summer. When you are drawn with Dublin and Mayo in the same group and then face another Division 1 team in the play-off it's tough," said Daly. "The scoreboard doesn't lie but we had four goal chances against Monaghan and if we had taken them it would have put them under pressure. "We played Tipp in the league final and lost by a point on the day. People talk about revenge, but when your backs are against the wall you see the character of a team. If we want it bad enough we'll go out and put in a performance worthy of staying in senior football. "Relegation is always a blow, and if we go down we'll be professional about it. We'll regroup but in general it's not something we want." On the injury front, Tipperary's Laura Dillon is definitely out with a knee injury, while Cavan continue to plan without the services of Mona Sheridan, Joanne Moore and Bronagh Sheridan. Cavan: E Baugh; R Doonan, L Fitzpatrick, S Reilly; S Greene, G McGlade, S O'Sullivan; A Cornyn, D English; C Smith, A Maguire, C Dolan; A O'Reilly, A Sheridan, C Finnegan. Tipperary: L Fitzpatrick; L Spillane, M Curley, B Condon; A.R. Kennedy, S Lambert, S Condon; A McCarthy, O O'Dwyer; E Buckley, A Moloney, N Lonergan; R Howard, M Morrissey, G O'Brien.